The jagguernaut of agitation rolls. Executives of Calcutta Telephones continues to have overwhelming participation in Relay Hunger Strike. An inexorable force, ready to fight through to the end. End means to obtain the legitimate demands and hung the curtain for the next crusade. Too much of pretence is being enacted by DOT and BSNL, seemingly behaving as though specific issues are not known to them. Sheafs of papers on demands and justification for E2 & E3 payscales had got used since a decade. Its hard to believe that formal communication is required further from BSNL to DOT. Its gladdenning to note that BSNL had reiterated its stand on E2 & E3 payscales but could not present the same to DOT efficaciously. The jagguernaut of agitation rolls. Executives of Calcutta Telephones continues to have overwhelming participation in Relay Hunger Strike. An inexorable force, ready to fight through to the end. End means to obtain the legitimate demands and hung the curtain for the next crusade. Too much of pretence is being enacted by DOT and BSNL, seemingly behaving as though specific issues are not known to them. Sheafs of papers on demands and justification for E2 & E3 payscales had got used since a decade. Its hard to believe that formal communication is required further from BSNL to DOT. Its gladdenning to note that BSNL had reiterated its stand on E2 & E3 payscales but could not present the same to DOT efficaciously. Let us continue exerting organisational pressure till the demands are achieved. Its time to be resolute and committed to our next phase of Trade Union Program. We are glad to see young executives joining in hordes to be part of this trade union program. Com Nirmal Sarkar President SNEA/CTC, Com Sadhan Mondol/AIGETOA, Com Dilip Saha CS/SNEA/CTC, Com Saikat Das CS/AIGETOA, Com Deepak Sahoo AGS/AIGETOA, Com Sankar Sanyal Jt Secretary(E)/SNEA and Com Prasun Mukherjee CS/AIBSNLEA/Calcutta Telephones addressed the house. Com Soumen Ghosh anchored the proceedings. Relay Hunger Strike continues with increased inertia. Increased number of members is sitting through hunger strike at Telephone Bhavan. The momentum of the crusade is mounting on the management. Executives cutting across associations are urged upon to be an integral part of this struggle. 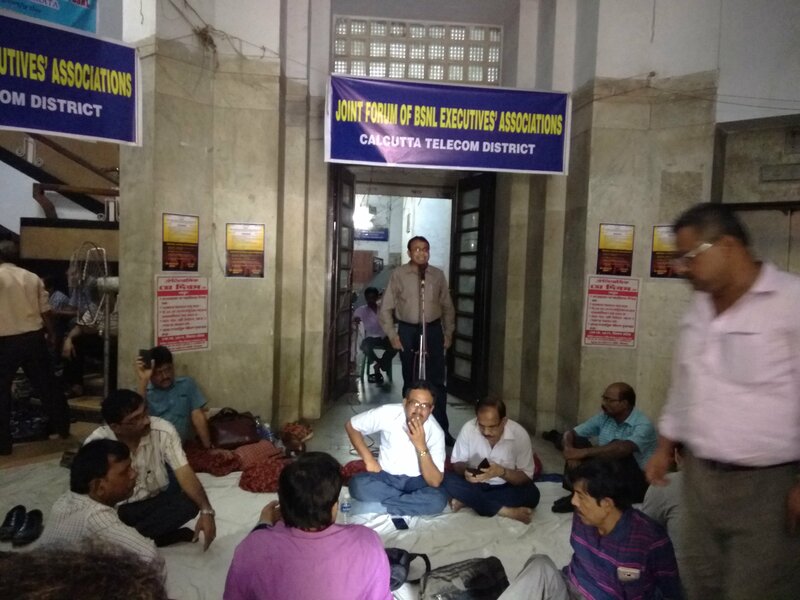 The action by the management at Corporate Office to remove the fasting comrades by police was thwarted by the agitators by adhering to their resolve to continue with the hunger strike. Joint Forum of BSNL Executive association urge upon all executives to apply for CL on 28/4/2017. Com Deepak Sahoo AGS/AIGETOA, Com Amar Hazra/AIGETOA, Com Amit Das, President AIGETOA, Com Prasanta Roy Org Secretary/SNEA and Com E Namboodari Convenor Joint Committe and Ex GS of BSNLEU addressed the gathering. 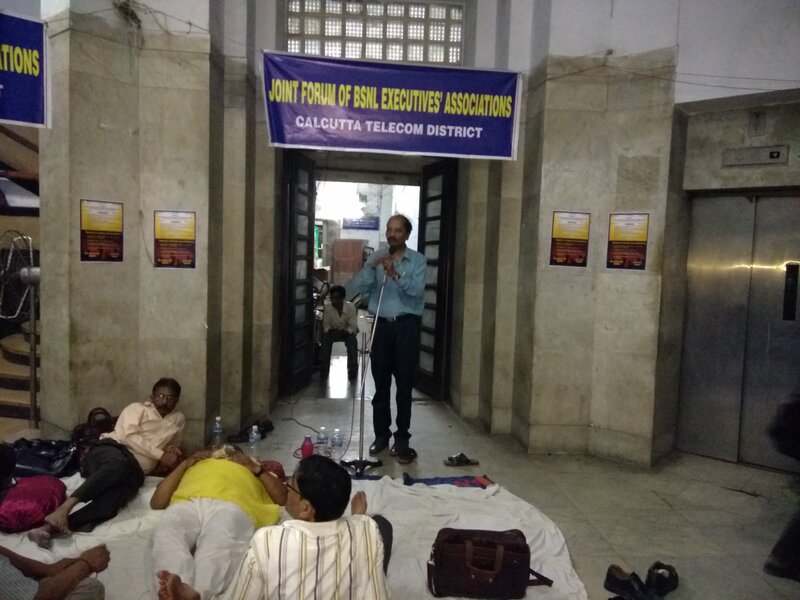 Joint Forum of BSNL Executives’ Association of Calcutta Telephones district started with an impressive note the program for Relay Hunger Strike that commenced from today i.e. from 25/04/17. Members of participant associations thronged the venue in groups and is sitting through the day in fast. Though a large number of executives were present, Joint Forum made intense appeal to come in hordes and converge at the venue as a mark of solidarity and resolve to fight for the cause. Speakers after speakers deliberated on the compelling circumstances that pushed the Forum into agitation and resolved not to budge unless the demands for E2/E3 payscales for JTO/JAO & SDE/AO ( other equivalent cadres), CPSU Heirarchy, 30% superannuation benefit to BSNL recruitees, promotion to the cadre of SDE/DE/DGM etc are materialised. They bore a strong resolve to continue with the crusade for the legitimate demands and would not brook with hobnobbing of the management. Circle office bearers of constituent associations have put across a strong message to all executives to abide by the call and apply for leave on 28/04/2017. As the time is critical, any let up on this count will have serious consequences in our future demands, be it implementation of 3rd PRC or other allied issues waiting in the pipeline. Com Saikat Das CS/AIGEOTA, Com Deepak Sahoo, AGS/AIGEOTA and Com Sadhan Mondol/AIGEOTA adressed the gathering. SNEA/CTC was represented by Com Nirmal Sarkar, President and Com Sankar Sanyal Jt Secy(E). Com Anup Mukherjee GS/SNATTA also addressed the house. Com Dilip Saha CS, SNEA anchored the proceedings. Com Dilip Saha CS, Com Sankar Sanyal Jt Secretary(E) and Com Nirmal Sarkar President met GM/HR and admin on scarcity of DGM/DE/SDE (regular), especially in areas like Howrah, Srirampur and Barackpur. It has been informed that about 9 nos SDE and one DE have joined from other circles and administration is contemplating to deploy these officers in area of acute scarcity. Around 20 SDEs have got released from their respective circles and are to join soon. Association reminded for considering Rule 8 cases since the officials are waiting for years. GM assured to consider the cases soon. In regard to endorsement of the list sent by Corporate Office following court verdict in respect of JTOs who had been officiating and are entitled to FR 22 1 (a)1 fixation, GM requested for some time since he had little time to examine the issue. However, he would examine the list shortly, so as to dispose off the matter without further delay. Association requested for some convenient time to discuss some critical and long pending agenda pertaining to PA/PS and individual officials too. GM readily agreed to discuss the issues in next week. 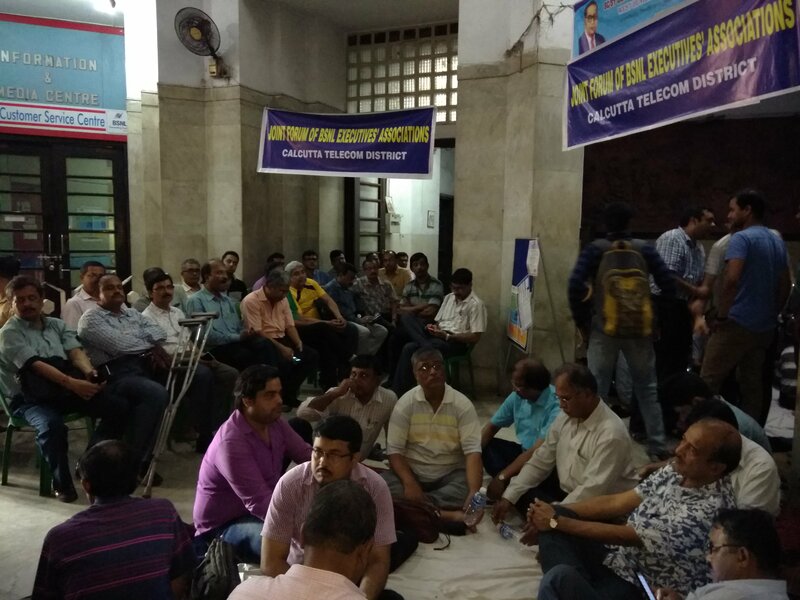 A Circle Office Bearers meet was held alongwith Zonal Secretaries, Zonal President, CEC Members, CWC Members, of Calcutta Telephones Circle at Telephone Bhavan to decide upon the modalities to be adopted in order to make the protest program a success. 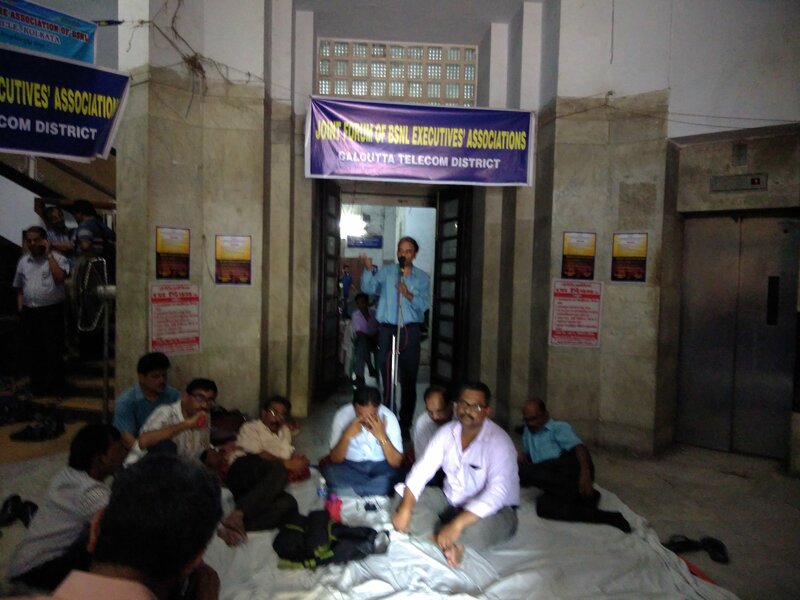 The Trade Union Program being launched is in protest against non implementation of E2 & E3 IDA payscales for JTO/JAO & SDE/AO and other equivalent cadres respectively, CPSE Hierarchy, 30% superannuation benefit to BSNL recruitees, Basic Pay of Rs 22820/for post 2007 recruitee, opposing DR/DGM recruitment etc. It is decided jointly, to print posters, banners and make arrangement for relay hunger strike scheduled to be held from 25/04/2017 to 27/04/2017 and with an appeal to all executives to take one day CL on 28/04/2017 as part of Mass Casual Leave Program. Joint mobilizing exercise shall be undertaken in all main buildings and zonal/branch representatives of constituent association shall meet together to take stock of the situation on every day basis and plan accordingly. The leave be applied well in advance. Given the situation, each and every member and executives supporting the cause should come out in full strength to convey the resentment of the executives for being deprived from justified demands. We ought to know that inspite of recommendation of BSNL Board, DOT has rejected the payscales for JTO/JAO & SDE/AO without any rational. Let us realise, any let up at this stage will push us back to an irrecoverable position. So lets fight organisationally for the very cause and let every one of us participate to show our severe opposition to DOT’s action to the detriment of the Basic cadre of JTO/JAO & JAO/AO and others. Com Saikat Das CS AIGEOTA attended the meeting. Joint Forum of BSNL Executives’ Associations of Calcutta Telephones met today at Telephone Bhavan to decide upon the modalities to be adopted in order to make the protest program a success. The Trade Union Program being launched is in protest against non implementation of E2 & E3 IDA payscales for JTO/JAO & SDE/AO and other equivalent cadres respectively, CPSE Hierarchy, 30% superannuation benefit to BSNL recruitees, Basic Pay of Rs 22820/for post 2007 recruitee, opposing DR/DGM recruitment etc. It is decided jointly to print posters, banners and make arrangement for relay hunger strike scheduled to be held from 25/04/2017 to 27/04/2017 and with an appeal to all executives to take one day CL on 28/04/2017 as part of Mass Casual Leave Program. Joint mobilizing exercise shall be undertaken in all main buildings and zonal/branch representatives of constituent association shall meet together to take stock of the situation on every day basis and plan accordingly. Com Deepak Sahoo AGS/AIGEOTA and Com Saikat Das CS of AIGEOTA attended the meeting . SNEACTC was represented by Com Dilip Saha CS, Com Sankar Sanyal Jt Secretary (E) and Com Ashok Kundu President/Central Zone. 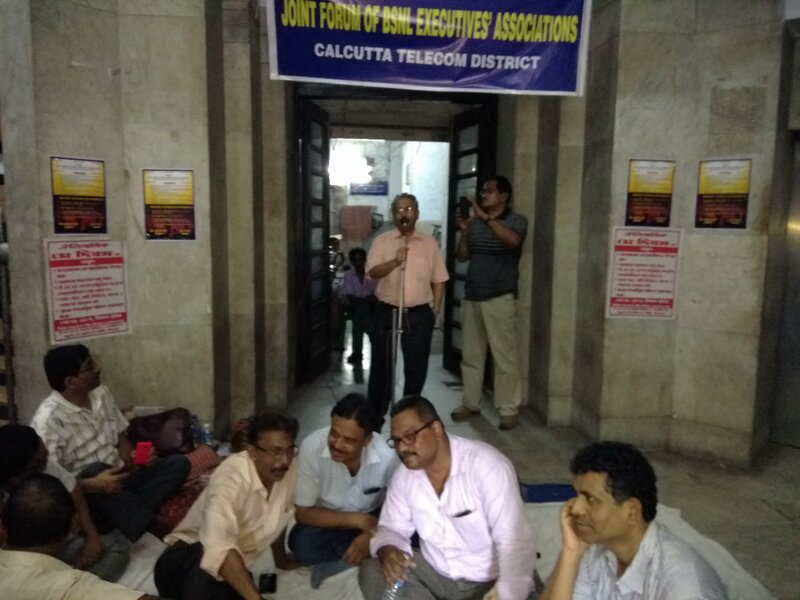 Members in large number sat in Dharna at Telephone Bhavan as a mark of protest for not granting E2 & E3 payscales for JTO/JAO & SDE/AO respectively and other equivalent cadres. The protest programme started with chant of slogans condemning DOT for derailing the process at its final stage. Speakers who addressed the gathering, unanimously sniffed conspiracy in govt’s intent to bring about industrial unrest thus affecting BSNL’s performance with respect to other telecom operators. The subtle and sometimes overt favour to Reliance Jio has eaten into the profit of all operators but because of dedicated effort of executives and non executives, BSNL could post operational profit. Com Nirmal Sarkar, President expressed dissapointment over inadequate presence of young executives who are in the cusp of losing their justified entitlement. if they to fail realize the danger of deprivation lurking ahead. He explained on larger conspiracy being committed by govt to to favour private operators. Com Sankar Sanyal Jt Secretary(E) elaborated on the issue of E2 & E3 IDA payscales and explained on the need to fight out unitedly without further delay. He called upon other executives associations to unite and fight for the cause of the basic cadres. Com Deepak Sahoo, AGS of AIGEOTA expressed his delight in supporting the cause and felt issues irrespective of its origin of initiation should be supported if it badly affects the interest of the basic cadre. One must shed ego to strengthen the cause. Com Subhasis Mitra ACS of AIBSNLEA observed that such causes should be discussed and initiated from common platform. He thanked for being invited and felt the unity should be from the core. Com Prasanta Ray, Organising Secretary SNEA/CTC expressed severe resentment for toying with issue and dragging it for too long. He spoke on irony of fate on govt’s conflicting stand on various issues. Com A Baidhya, a young comrade of Howrah Zone felt inspired in associating with the struggle but regretted over low presence of comrades of his seniority who are supposed to be in the centre of struggle. Com Dilip Saha CS, made an absorbing deliberation on unity and how unity can be forged inspite of having separate entity. Its the cause that unite people and there should remain no other reason to stay away. As a recognised association, it was the duty of SNEA to launch protest promptly to hold up further progress, being contemplated by the management. He spoke of a weird situation wherein DOT is declining the justified demand inspite of being recommended by BSNL. He called upon the young executives to respond spontaneously since the benefits are meant for their generation. Let the realization dawn in every executives to fight for the cause to its end. Its solidarity, dogged perseverance and dedication that make things/demands achievable. Com Dilip Saha CS and Com Nirmal Sarkar President met CGM/CTD on scarcity of staff under various verticals and Areas. Association requested to expedite the process of appointment of BSNL recruitee JEs, so that they could be posted in much needed areas at the earliest. This apart, a substantial number of JEs qualified in LICE and they required to sent for induction training on immediate basis. Association also reminded CGM on JTO trainees who are on the verge of becoming JTOs on completion of stipulated training schedule and the need for proper deployment. CGM took cognisance of the items and said, he would keep the suggestions under consideration while taking decision on the issues. Association pointed to the long pending inter circle transfer order awaiting for release. It includes, mostly the executives( both SDEs & DEs) who had joined from Southern states. It also requested CGM to pursue with Corporate office in releasing the executives who are to join CTD from other circles. A constant flow would lessen the problem of inordinate delay in releasing the officials. CGM said to be aware of the matter and would speak to GM/HR & Admin to consider their release shortly.